“WE are THREE” is a collaborative effort between co-parents Kerri-Lynn Reeves and Aron Williams and their toddler-daughter Finley Rae Reeves Williams. 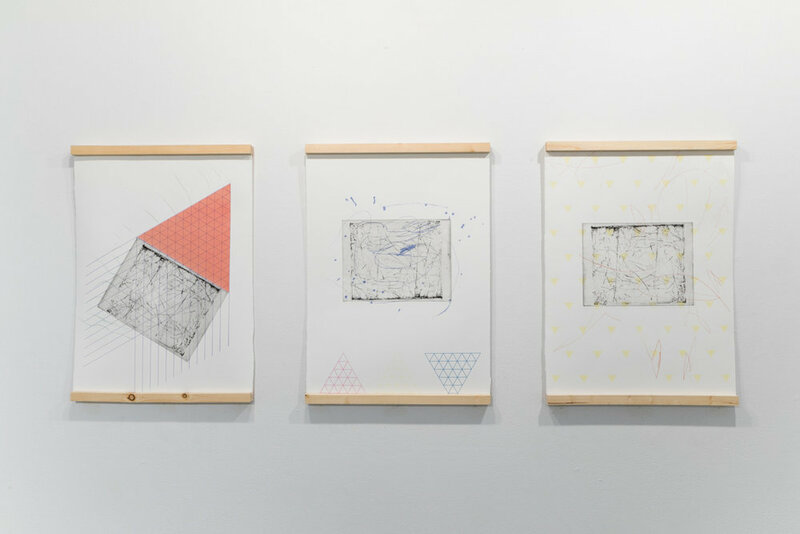 “WE are THREE” is a mark-making based exploration utilizing geometric abstraction, geographic representation, and free-form expression to muster theories of social space, embodied site, and organic disruption and generation. This series of images combines and layers various print techniques, including screen print, chine-colle, and intaglio processes photo polymer and dry point etching, to express the different drawings styles of all three collaborators.